Scholarships available for qualifying Danby campers. 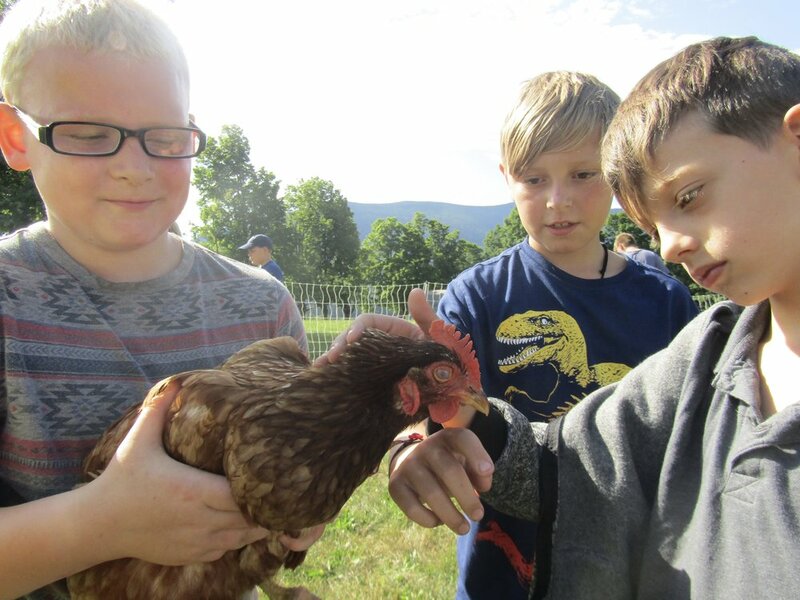 Our camp program explores the forests and the Community Farm at Smokey House Center, with a mix of guided activities as well as less structured time for exploration and discovery. Campers build huts, pick flowers, look for bugs, grow and eat food from the garden, watch birds, chase frogs, play games, and generally spend their week outdoors. No handheld electronic devices, no screens, just a summer full of farm and forest fun. Camps are led by a skilled adult leader with youth leaders serving as assistants. See the daily camp schedule outlined here. Email camp@smokeyhouse.org or call 802.293.2300 for more information. REGISTER BELOW or download and print a copy of this registration form here. Camp Director McKayla Baker is currently a field faculty with the Expedition Education Institute, leading gap-year and undergraduate students through an immersive farm-and-food semester throughout California. McKayla studied environmental conservation and sustainable food systems. She has worked in a range of outdoor and alternative education settings, and in schools. She has technical training and certification as a Wilderness First Responder. McKayla visited Smokey House last fall and assisted on the Community Farm. She was once a caretaker with the Green Mountain Club at Little Rock Pond in Mt. Tabor, and is excited to get back to this neighborhood. McKayla loves being outside with kids. Assistant Director to be announced. Camp Registration Fee: $125 per camper, per week. After care offered for a flat rate of $ 20/wk. We have made every effort to offer this camp for a reasonable, modest fee. We do not offer reduced pricing for multiple weeks or multiple campers. Please expect to provide lunch for your camper(s) daily. We will provide some purchased snacks and food from our gardens. We will offer after-care daily from 3pm-5pm for a flat weekly fee of $20. Thanks to the generosity of several local donors, full scholarships for Danby residents may be available. Please contact us if you are interested.